The all-new 2015 Hyundai Sonata was redesigned for this model year with upgrades both inside and out, including a new turbocharged engine option and more interior room. The Sonata competes in a crowded marketplace and manages to stand out anyway. 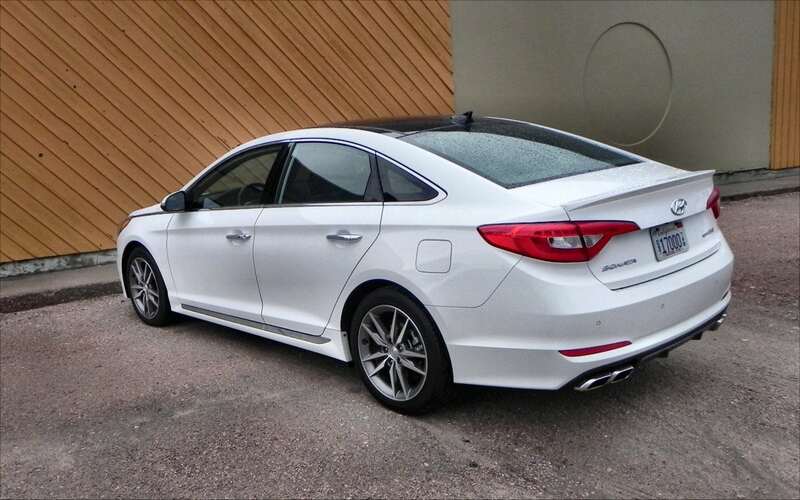 The swooping, European styling of the previous Sonata has been replaced with a more sedate, grown up look that fits much better with the expected buyer for this car. While the previous-gen Sonata was beautiful and unique, it was also polarizing and a bit over-done for many potential buyers. The curves have been flattened a bit and the heavy use of body lines reduced to become much more contemporary and sleek. We like the new look as much as we did the old, noting that the stand out quality of this new design is created by details rather than the overall theme. 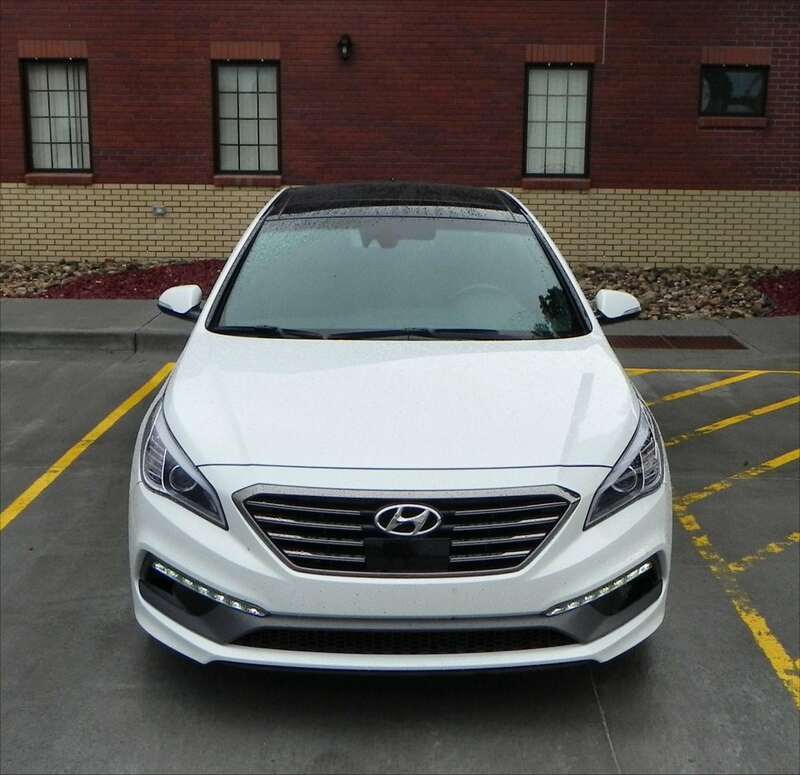 The 2015 Sonata’s grille and hood are non-aggressive, but a hint of hidden tenacity is seen in the sharp points between the grille and the narrow headlights. A strong body line runs along the doors, creating a shadow of a divot beneath wherein the door handles sit. This makes for more curvature without there being any actual curve, building on the coupe-style roof and clipped deck lid. The overall appeal is very real and nicely done, but not in-your-face. 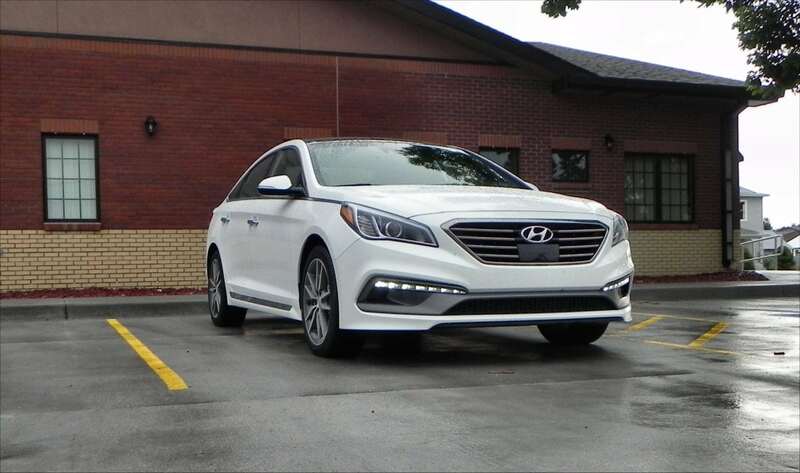 The Hyundai Sonata is a five-passenger midsize sedan available in six trim levels, including a hybrid model, and four powertrain options. 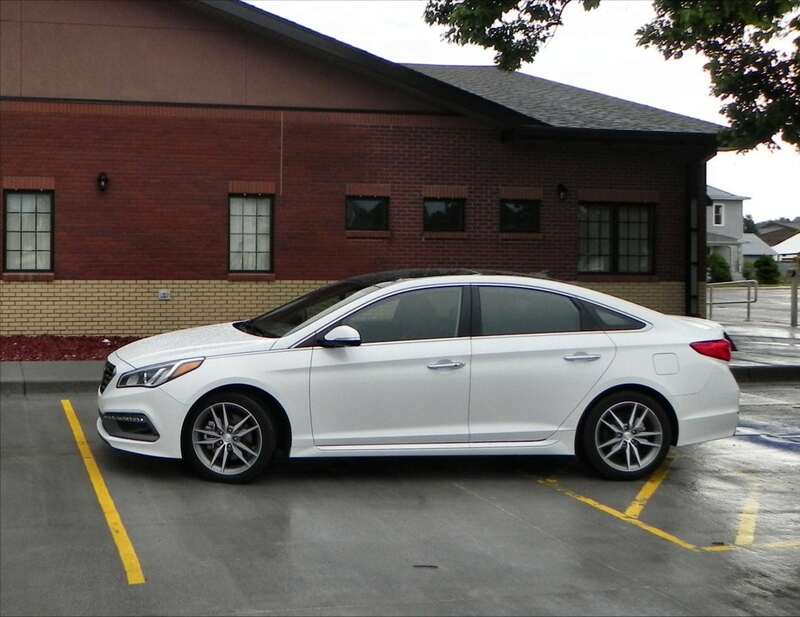 Our test model was the 2015 Hyundai Sonata Sport 2.0T with the added Ultimate package of features (see synopsis and window sticker link above). 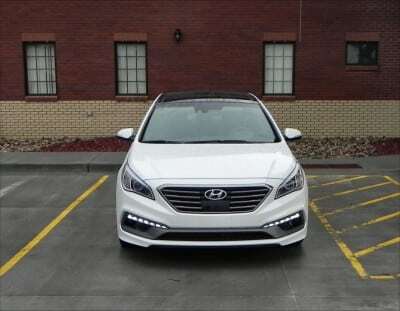 The interior of the new Sonata is well done with a much more elegant appeal. The quality of materials belies the “cheap” reputation Hyundai is finally beginning to shed and the layout throughout is comfortably well-designed. Front seating is comfortable and ergonomic with a fair amount of storage room and a nice controls layout for the driver. Soft touch materials adorn most of the surfaces. 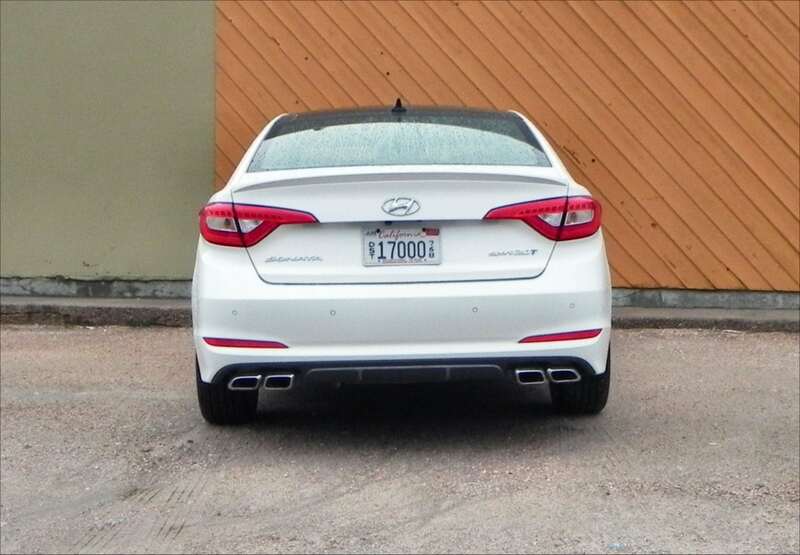 The back seat is where a lot of improvement comes for this new 2015 Sonata. Legroom and shoulder room are much better. Headroom is somewhat cramped for someone my size (six feet three inches), but manageable. Certainly better than many in this class. The trunk is a big 16.3 cubic feet, a definite “Jersey 2-body.” A cool new hands-free system automatically opens the trunk on equipped models when the keyfob is near them for a few seconds. A nice feature for busy folks carrying a lot of things to the car. 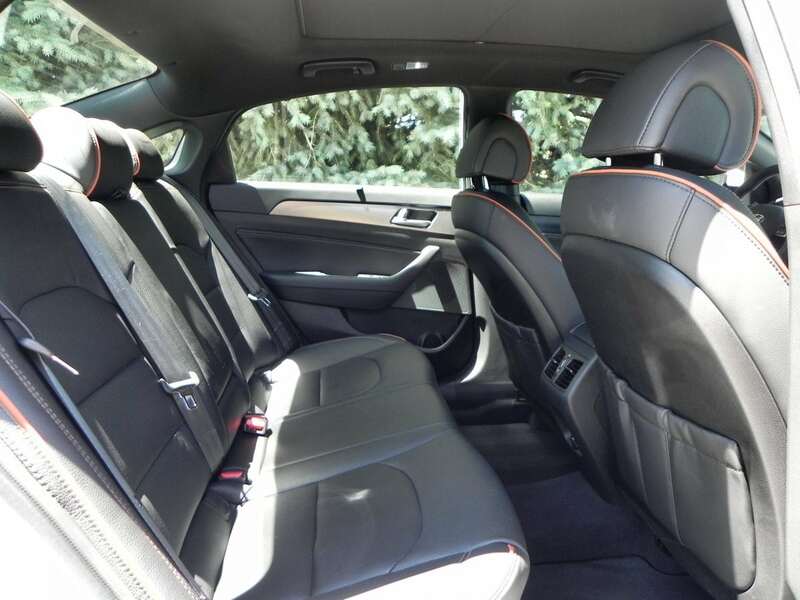 The rear seats are 60/40 split-fold, adding more cargo space when needed. 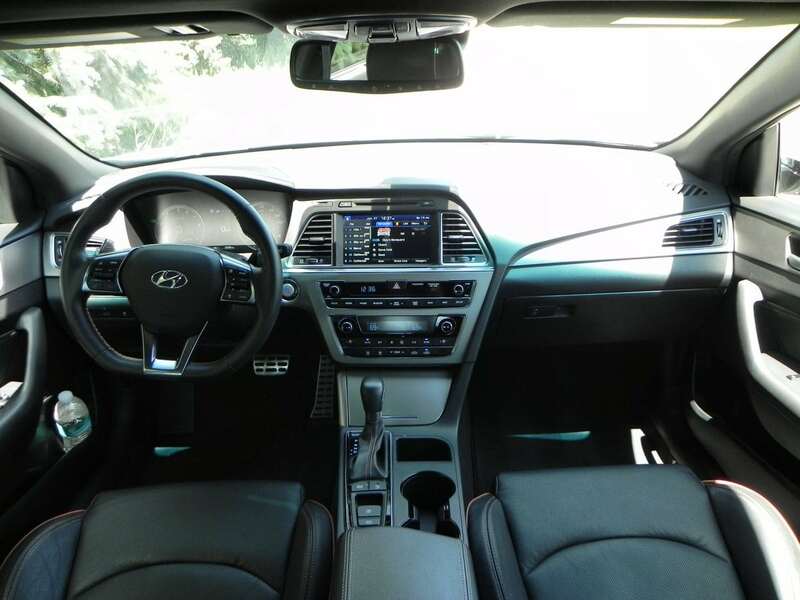 Infotainment is top shelf in the 2015 Hyundai Sonata. 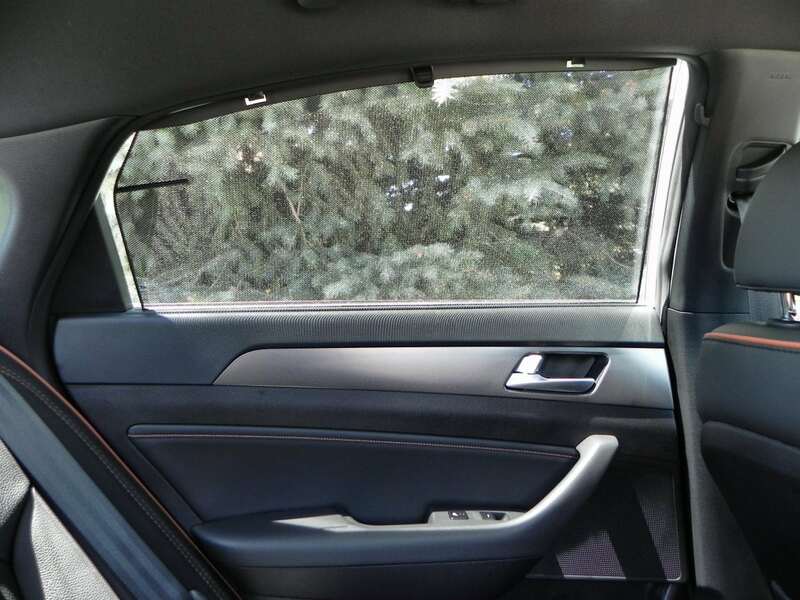 The base model has a small 5-inch touchscreen, but upgrading to the navigation option adds a beautiful 8-inch touchscreen to the center stack. This screen has well-defined graphics and a nice, easy to operate interface. 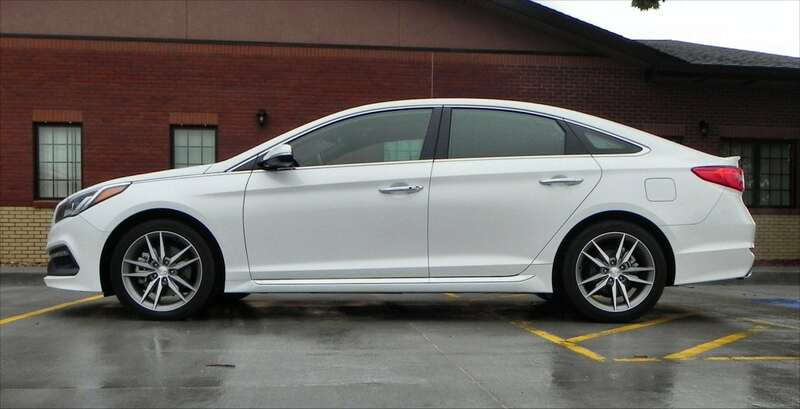 The 2015 Hyundai Sonata base SE model as well as the Sport and Limited models are powered by a 2.4-liter four-cylinder engine that produces 185 horsepower and 178 pound-feet of torque. A six-speed automatic transmission is standard, as is front-wheel drive. 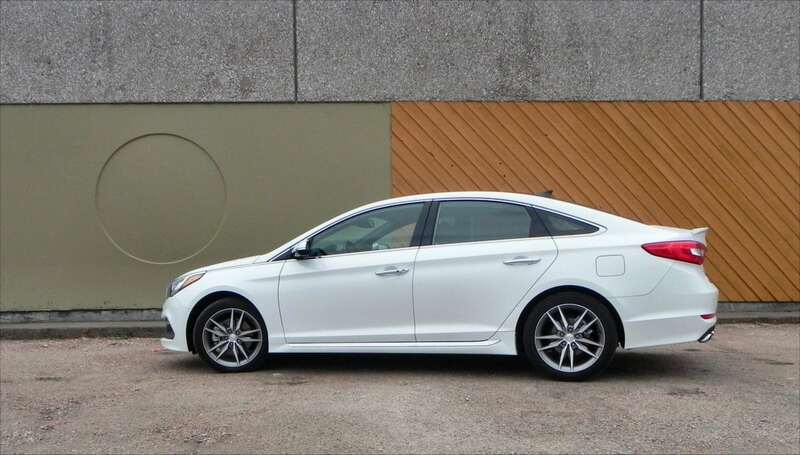 The EPA rates the Sonata SE at 29 mpg combined, 25 in the city and 37 on the highway. The Sport and Limited trims are slightly less efficient due to extra equipment weight, ringing in at 28 mpg combined (24/35). 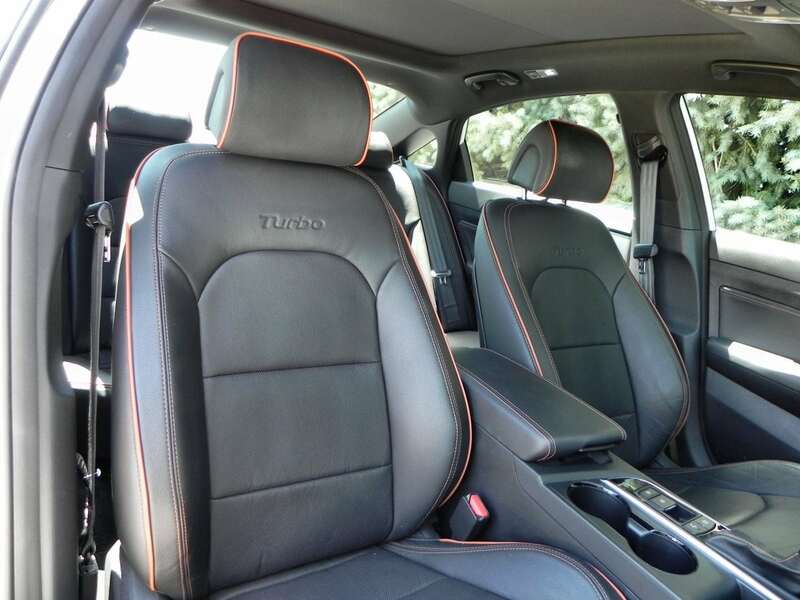 The Eco trim features a 1.6-liter turbocharged four-cylinder that produces 177 hp and 195 lb-ft of torque. A seven-speed automatic transmission is standard. 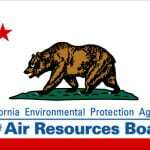 This model has an EPA rating of 32 mpg combined (28/38). The Sport 2.0T model as we drove it includes a new 2.0-liter turbocharged four-cylinder engine that produces 245 horsepower and 260 pound-feet of torque. This is meant to compete with the V6 option in some competitors and does a good job of it, though it’s not as peppy as some larger-displacement sixes. A six-speed automatic transmission is standard and fuel economy estimates of 26 mpg combined (23 city, 32 highway) are definite selling points against those V6 options. 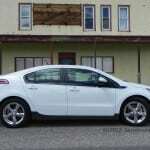 Our real-world driving saw 27 mpg combined in this car in a heavy highway mix. 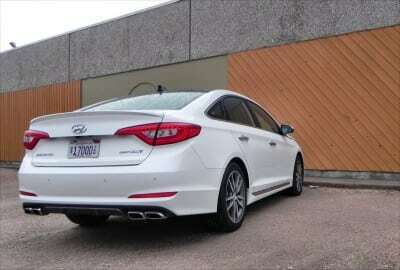 Lastly, the Hyundai Sonata Hybrid remains unchanged from last year, retaining the old body and interior as well. The 2015 Hyundai Sonata is a good drive, though some rivals have a more sporty appeal. The really surprising thing about the Sonata, though, is how quiet it is. 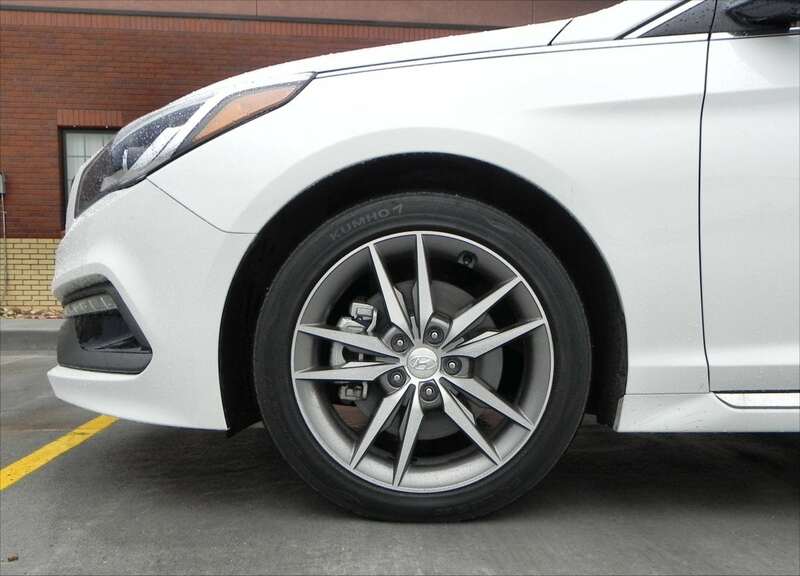 Some luxury sedans cannot boast the level of silence on the road that the Sonata boasts. This library-like atmosphere translates to the suspension as well, which eats up road bumps without a wince. Even with all that silence, though, the Sonata doesn’t feel dead to the driver. If anything, it’s more akin to being disinterested than it is dead, sending enough feedback to the driver so that you feel in control, but not overwhelming in any way. It’s solid, sure of itself, and easy to drive. This segment isn’t known for its sporty sport models, but compared to many, the Sonata Sport is just kind of a let down. The bolstered seats and flat-bottomed steering wheel seemed to promise more than was delivered. 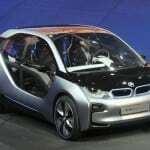 We’d recommend considering the similarly-priced and performing Eco model instead. There is no lack of competition in the midsize sedan segment. We like the Chrysler 200, the new Toyota Camry, and the beautiful Mazda6. The Chrysler 200 is more engaging to drive and much more sophisticated in appeal, but has a higher price point as well. The Toyota Camry is all-new for 2015 and offers similar drive dynamics and more interior room. It’s the best-seller for a reason. The Mazda Mazda6 is a beautiful sedan and in our minds is class-leading for its exterior design. It’s great interior and engaging drive dynamics are high points for sure. 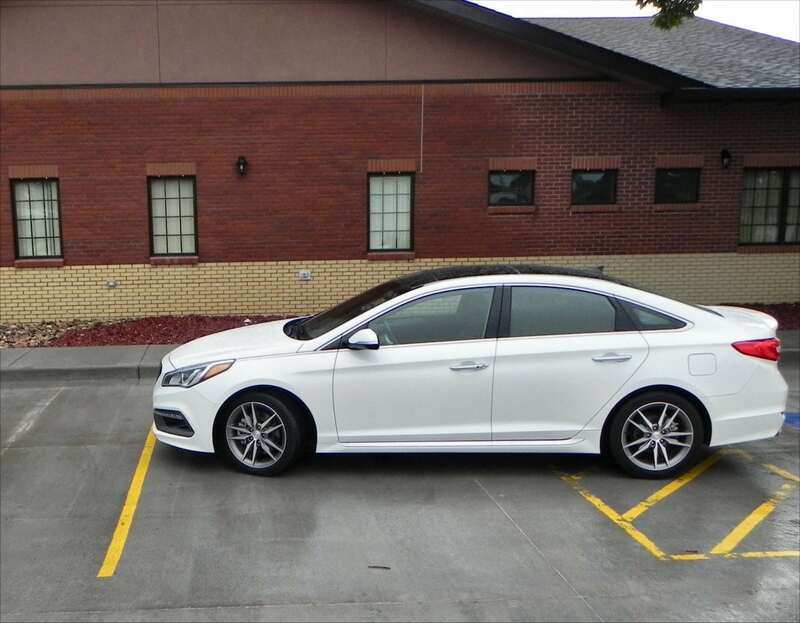 Compared to these, the 2015 Sonata offers a well-rounded mix of comfort, roominess, and interior ergonomics to go with its curbside appeal. We consider this an A-grade car. Not as sporty as some. 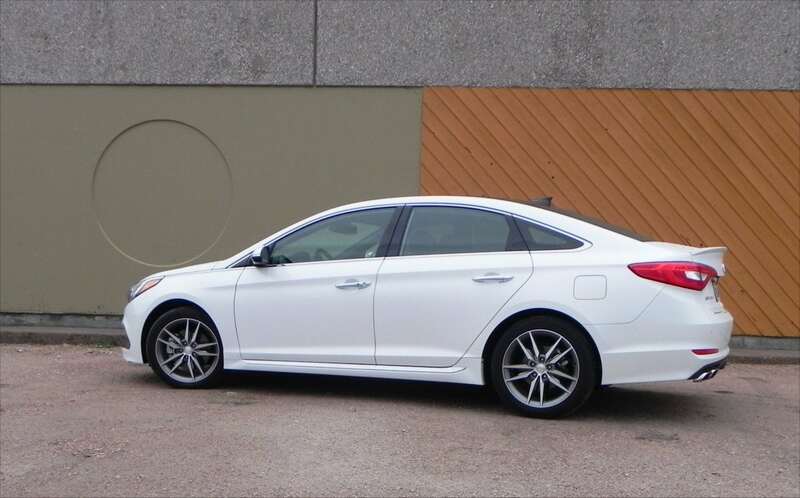 Overall, we’ve rated the 2015 Hyundai Sonata with an “A” and it should be on any midsize sedan shopper’s list of must-tries. 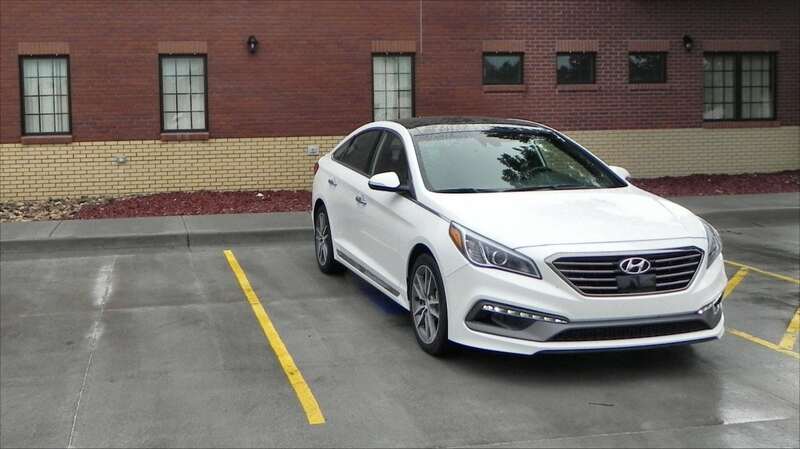 Others may have more bling, more “wow,” or more fun on the road, but few will rival the Sonata’s well-rounded appeal for the price paid. 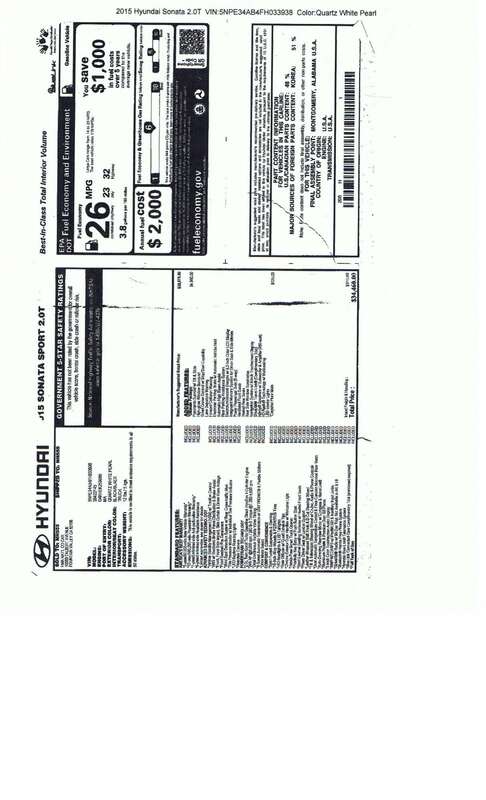 The Sonata was a manufacturer’s press loan for about a week. 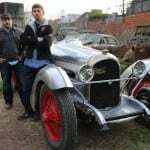 During that time, 232 miles were put on the car in a mix of highway and in-town driving with various passenger loads.